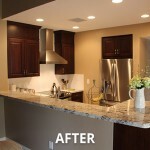 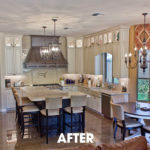 Kitchen remodeling Scottsdale – this kitchen was transformed with an addition for dining, walk-in pantry, laundry room, and powder room. 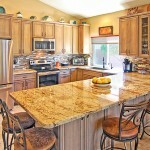 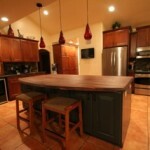 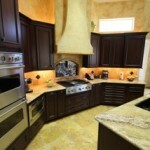 The homeowners also wanted an island with a breakfast bar. 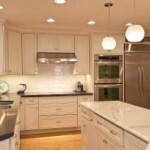 They love the focal point of the back splash and custom wood hood, the corner sink and window, and the generous lighting. 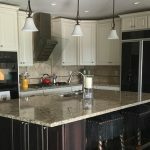 They also loved using both wood stain and painted (in dining area) Dura Supreme CabinetryDura Supreme Cabinetry Dark wood makes for a warm, welcoming atmosphere perfect for a family kitchen. 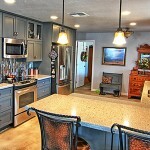 The stainless steel appliances make for a clean and modern look.